Whitby Online / Where is Whitby? Put simply, Whitby is a small seaside town located on the North Yorkshire coast, in the North East of England, between Scarborough and Redcar. But it is also rather more than that. Whitby is isolated from the surrounding major towns due to the protective influence of the North Yorkshire Moors National Park and the local geography. There are no motorways, dual carriageways, planes or high speed trains connecting Whitby to anywhere else - and it seems very likely that there never will be. Annoying when you want to get to here in a hurry, but such an important part of the unique ambience. A lost world, stuck in time and dripping with history. 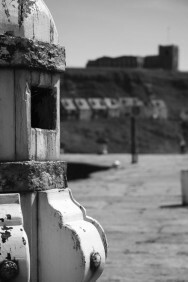 Whitby Online - Where Is Whitby?